Help us double our readership this week. As you savor our greatest hits, take a second to share them with someone else. It’s time to talk about trees. Why? Because I live in Tulsa, Oklahoma, where a summer day is typically around 95 degrees Fahrenheit with something like 50% humidity, resulting in a heat index of more than 105 degrees. This is just a scientific way to say that it’s hotter than hell-fired habaneros out there. And to be frank, nobody cares about walkable urbanism when they’re sweating through their clothes. One summer day, despite the soaring temperatures, I decided to run a couple errands. Since both trips were within a mile and a half of my house, I hopped on my bike. For the first mile or so, I was able to cut through neighborhoods where mature trees shaded my route. With the shade and a nice breeze, the ride was amazingly comfortable. “This isn’t so bad,” I thought, casually dismissing all the heat warnings I’d heard earlier in the day. The only thing worse than biking on a treeless street on a scorching hot day is walking on one. Since cycling creates its own breeze, you get some relief through evaporative cooling. You also reach your destination faster, which minimizes the agony. Without trees, walking along a typical city street in the summer heat is not only unpleasant, it can be life threatening. Unfortunately, here in Tulsa, our urban forest has suffered in recent decades. In my lifetime alone, a number of tragic events — both man-made and natural — have decimated our once dignified tree-lined streets. Dutch Elm Disease, wind storms, ice storms, and butchering by unqualified tree-trimmers (many hired by the local electric company to protect power lines) have destroyed countless thousands of mature trees throughout the city. When it comes to creating tree canopies, many obstacles are enshrined in public policy. Zoning codes apply to private property, not the city’s right-of-way, so required trees are often set back too far from the street to create a pleasing pedestrian environment. Engineering standards require clear sight lines next to the road, which prevents street trees from being located where they are most effective. And the local power company recommends planting short, ornamental trees near power lines, which, all too often, are located along arterial streets. Together, these rules eliminate the possibility of creating or restoring a tree canopy that would benefit pedestrians and cyclists throughout the city. We have a long way to go to replace what has been lost. But we have to keep working because street trees make places more walkable and bikeable and beautiful — all of which should be reason enough to fight for better streetscaping. 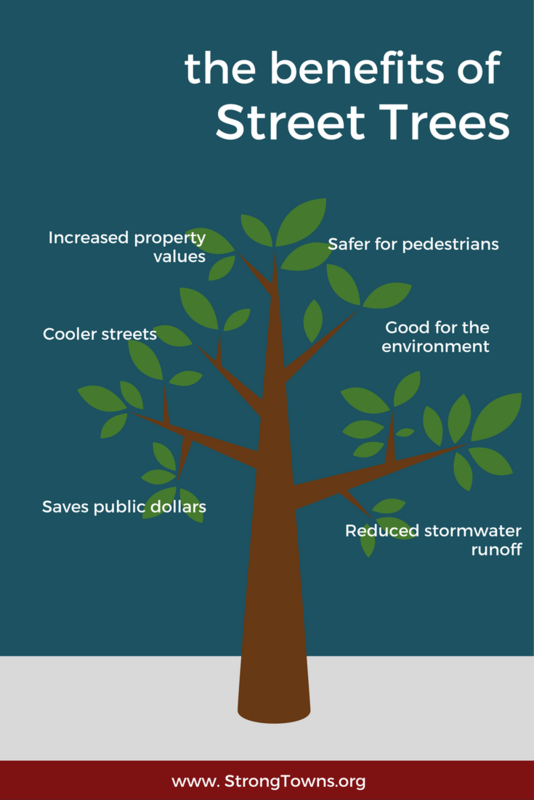 Whether you care about the environment, energy savings, property values, public health, or your city’s bottom line, plant a tree by the street. You’ll make sweaty cyclists and pedestrians happy for generations to come.